Dr. Karl-Heinz Kuck presented new advances in balloon technologies for AF ablation at AF2107. Electrical isolation of the pulmonary veins is the ‘cornerstone’ approach to treat symptomatic atrial fibrillation (AF) by catheter ablation.1,2 Traditionally, pulmonary vein isolation (PVI) has been achieved by circumferential heating of the left atrial tissue surrounding the pulmonary veins in a serial, ‘point- by-point’ application of focal radiofrequency current (RFC) lesions utilizing irrigated electrode catheters and electroanatomical guidance. In his session on Friday, Karl-Heinz Kuck, MD (Asklepios Klinik St. Georg, Hamburg, Germany) explored new advances in balloon technologies for AF ablation, including the cryoballoon, endoscopic PVI, and the Apama® RF balloon. Both generations of the cryoballoon were tested for efficacy in the treatment of drug-refractory paroxysmal AF against RFC catheters with and without contact-force sensing (Biosense Webster, Inc.) in the randomized, multicenter FIRE AND ICE trial. The trial confirmed its hypothesis of noninferiority, in terms of time to first documented clinical failure within one year outside a 90-day blanking period, of the cryoballoon vs RFC ablation in 374 patients undergoing the former and 376 patients undergoing the latter treatment modality.3 Clinical failures assessed in this primary efficacy endpoint of the trial included the recurrence of AF (lasting for more than 30 sec), atrial flutter or atrial tachycardia, the prescription of class I or III antiarrhythmic agents, and repeat ablation. Primary efficacy rates (Kaplan-Meier estimates) were 34.6% for cryoballoon ablation and 35.9% for RFC ablation, corresponding to a hazard ratio of 0.96 (P=0.0004 for noninferiority; Figure 1). The primary safety endpoint of FIRE AND ICE — a composite of all-cause death, all- cause stroke/transient ischemic attack, arrhythmia-related and non-arrhythmia-related serious adverse events — was also not found to be different between the study groups at 1 year, with estimated event rates of 10.2% in the cryoballoon group and 12.8% in the RFC group (hazard ratio 0.78; P=0.24).3 Methodology-specific differences were observed for the duration of the ablation procedure, which was on average significantly shorter for cryoballoon ablation (124 vs. 141 minutes for RFC ablation; P<0.0001), and for fluoroscopy time, which was on average significantly longer for cryoballoon ablation (22 vs. 17 minutes; P<0.0001). 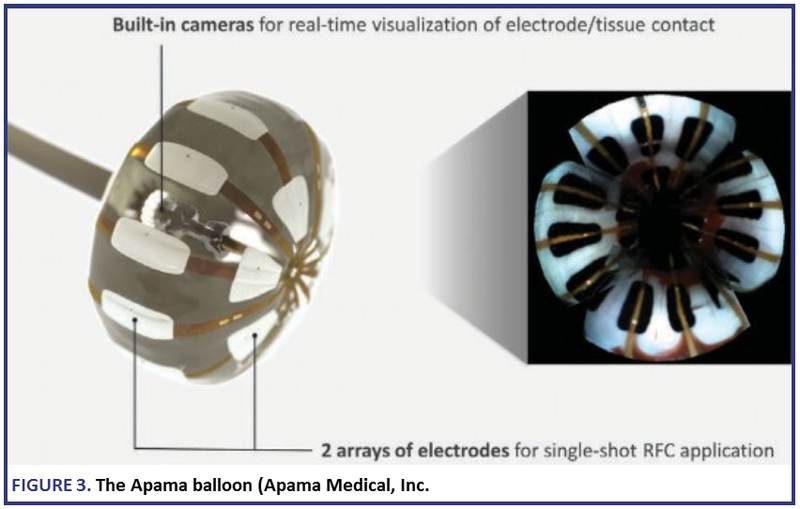 The Apama® RF balloon (Apama Medical, Inc.) is a new RFC ablation catheter that combines balloon efficiency with single-point RFC versatility (Figure 3). It consists of an anterior and lateral row of flat, irrigated electrodes. Multipoint RFC application allows for single-shot, customizable ablation geometries. Since the balloon is flat, not only can it be used for PVI, but it can be used for focal ablation and for linear or circular lesions within the atria as well. Four built-in cameras enable real-time visualization to assess electrode contact sites with blood contamination. What is the take-home message? “A variety of balloon-based catheter ablation systems are currently being developed to overcome the limitations of PVI by way of serial point-by-point RFC application,” said Dr. Kuck. Haissaguerre M, Jais P, Shah DC, et al. Spontaneous initiation of atrial fibrillation by ectopic beats originating in the pulmonary veins. N Engl J Med. 1998;339:659-666. Verma A, Jiang C, Betts TR, et al. Approaches to catheter ablation for persistent atrial fibrillation. N Engl J Med. 2015;372:1812-1822. Kuck KH, Brugada J, Fürnkranz A, et al. Cryoballoon or Radiofrequency Ablation for Paroxysmal Atrial Fibrillation. N Engl J Med. 2016;374:2235-2245. Kuck KH, Fürnkranz A, Chun KR, et al. Cryoballoon or radiofrequency ablation for symptomatic paroxysmal atrial fibrillation: reintervention, rehospitalization, and quality-of-life outcomes in the FIRE AND ICE trial. Eur Heart J. 2016 Jul 5 [Epub ahead of print]. Schmidt B, Metzner A, Chun KR, et al. Feasibility of circumferential pulmonary vein isolation using a novel endoscopic ablation system. Circ Arrhythm Electro-physiol. 2010;3:481-488. Dukkipati SR, Neuzil P, Kautzner J, et al. The durability of pulmonary vein isolation using the visually guided laser balloon catheter: Multicenter results of pulmonary vein remapping studies. Heart Rhythm. 2012;9:919-925. Metzner A,Wissner E, Schmidt B, et al. Acute and long-term clinical outcome after endoscopic pulmonary vein isolation: results from the first prospective, multicenter study. J Cardiovasc Electro-physiol. 2013;24:7-13. Dukkipati SR, Cuoco F, Kutinsky I, et al. ; HeartLight Study Investigators. Pulmonary Vein Isolation Using the Visually Guided Laser Balloon: A Prospective, Multicenter, and Randomized Comparison to Standard Radiofrequency Ablation. J Am Coll Cardiol. 2015;66:1350-1360.